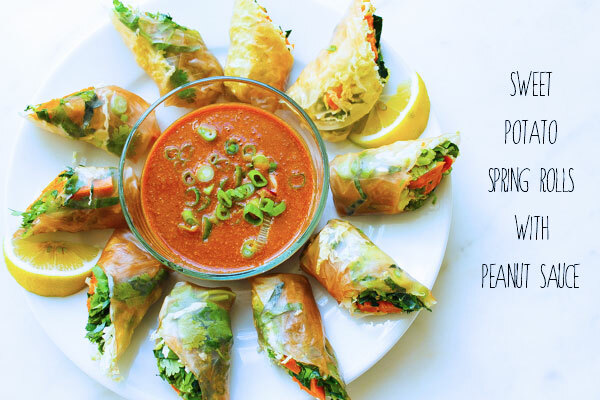 I’ve been cooking for a family of four this week and they flipped for these sweet potato spring rolls! They’re great to take on the road, they keep well and the sauce is very flavorful. Of course you can adjust the filling to your taste, but the roasted sweet potato has a wonderful texture and mellow flavor that complements the herbs and peanut sauce. Other filling ingredients might include tofu, sprouts, tempeh, spicy greens, or pumpkin! The brown rice wrappers have a nice nutty flavor and are more nutritious than typical rice paper. Toss the sweet potato sticks in olive oil, salt and pepper. Arrange on a baking sheet and roast for 10-15 minutes until tender and slightly browned. 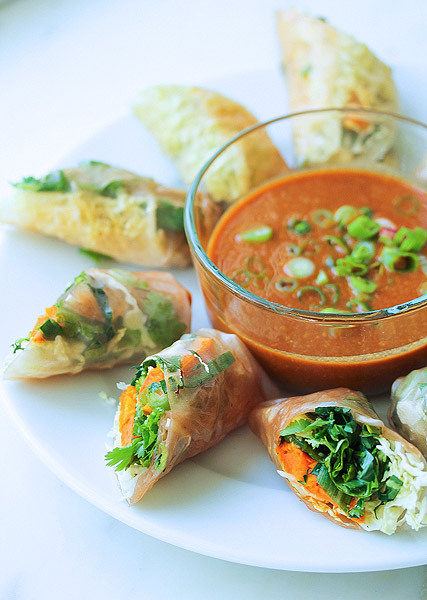 Have all of the filling ingredients prepped and ready for rolling the spring rolls as it’s best to work fast. Fill a wide shallow pan with room temperature water to soak the wrappers. Put a single sheet of brown rice wrapper in the water for 10-12 seconds. Remove from the water and lay flat onto your counter. Fill with a small handful of shredded been cabbage, a few sprigs of cilantro, 2-4 pieces of roasted sweet potato, 2 slices of avocado, a teaspoon of chopped green onion and a few pieces of bell pepper. 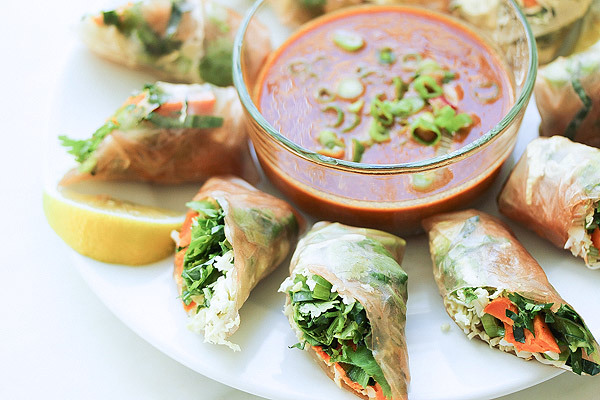 Drizzle with sriracha. Working quickly, fold both sides in and roll up tightly. To store, cover with a damp towel unit ready to eat so they don’t dry out. Whisk ingredients together until smooth. Keep refrigerated until ready to serve. Yours look absolutely delicious and I especially love sweet potato and kale together and the sauce, just yum!